Meadow on the Rocky Mountain Continental Divide where a stream divides into two streams, one flowing to the Atlantic Ocean and the other to the Pacific Ocean. Two Ocean Divide Region north aerial view. The Continental Divide through northwestern Wyoming is shown by red line. 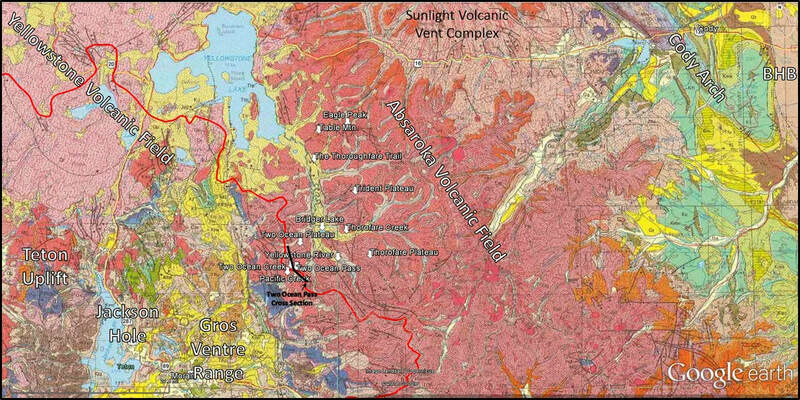 Vent complexes of the Eocene age Absaroka volcanic field are labeled. About two and a half decades later Jim Bridger discovered a passage over the continental divide that divided the country into parts separated by water flow directions. It was a far cry from the commercial passage envisioned by Jefferson’s hopeful geography. Transcontinental travel by this route would only be possible by freshwater fish. 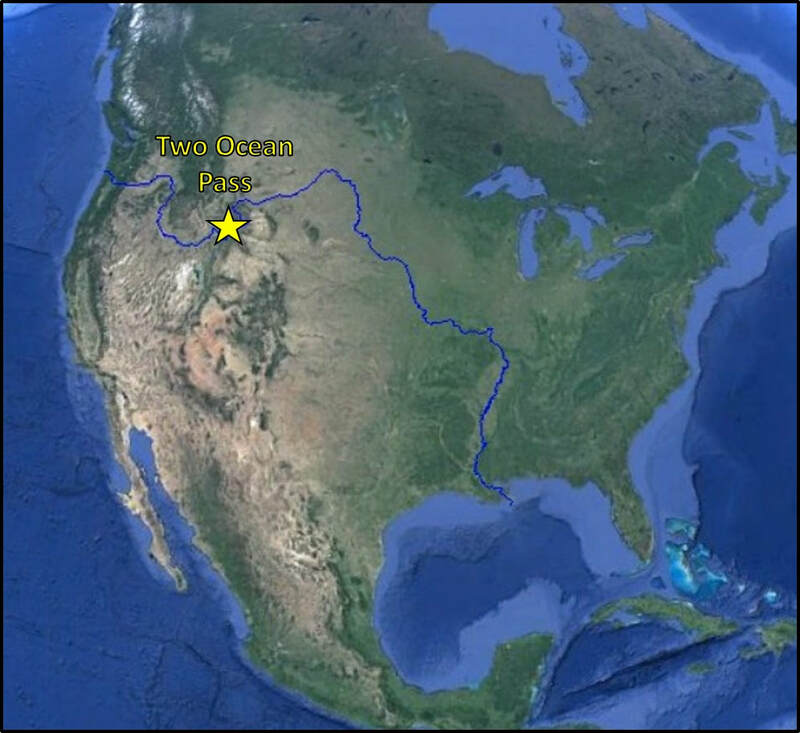 The connection of Pacific Creek with the Snake and Columbia Rivers and the connection of Atlantic Creek with the Yellowstone, Missouri, and Mississippi Rivers. The North American Continental Divide extending from Alaska to South America. 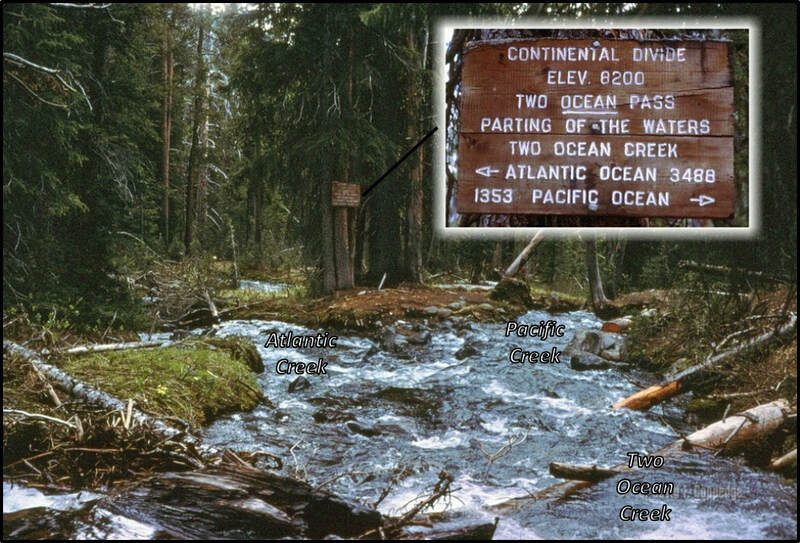 “Two Ocean Creek is approximately three miles long, flowing southward along the Pacific side of the Continental Divide. In lowest water stages the Creek is four or five feet wide and about six inches deep where it divides into two approximately equal streams. Atlantic and Pacific Creeks. The division takes place in the timber, rather than in the open park, about a hundred yards above a marshy type of meadowland, through which both streams meander some distance before breaking away from the divide. A drawing made in 1894 of Two Ocean Pass with a view to the northeast. Atlantic Creek exits the pass between the hills in the upper part of the image. Pacific Creek exits to the southwest in the lower part of the image. North Two Oceans Creek enters from the left side of the image and divides into its two distributaries and South Two Ocean Creek enters from the right of the image and is also shown dividing into two streams. Evermann Creek also enters the area from the west (just above the tents). South view of the Parting of the Waters on Two Ocean Creek in timber region. Image: After Coppedge, D., 1968, Two Ocean Pass, Wyoming: flicker; https://www.flickr.com/photos/psa104/12164778034/in/photostream/. Two Ocean Pass was listed as a National Natural Landmark Site in 1965 and is located within the Teton Wilderness (established in 1964). The Teton Wilderness is bounded on the north by Yellowstone National Park (1872), to the west by Teton National Park (1929), and the Washakie Wilderness to the east (1964). The water flows on Middle to Upper Eocene Thorofare Creek Group, Absaroka Volcanic Supergroup (see https://www.geowyo.com/absaroka-volcanic-province.html; https://www.geowyo.com/dead-indian-hill.html; and Sunlight Basin site link). Topographic features at Two Ocean Pass. Labels; Land, brown outline, Water, blue outline, Continental Divide, red outline and line. Schematic cross section of Absaroka Super Group cross sections AA’ and BB’ shown by white dotted lines. Schematic cross section of Absaroka Super Group. Two Ocean Plateau geology is the same as Trident Plateau on the right side of the cross section. Image: After Smedes, H.W., and Prostka, H.J., 1972, Stratigraphic Framework of the Absaroka Volcanic Supergroup in the Yellowstone National Park Region: U.S. Geological Survey Professional Paper 729-C, Fig. 5, p. C9; https://pubs.usgs.gov/pp/0729c/report.pdf. Absaroka Super Group stratigraphic column. Image: After Smedes, H.W., and Prostka, H.J., 1972, Stratigraphic Framework of the Absaroka Volcanic Supergroup in the Yellowstone National Park Region: U.S. Geological Survey Professional Paper 729-C, Fig. 4, p. C7; https://pubs.usgs.gov/pp/0729c/report.pdf. Two Ocean Pass cross section of Thorofare Creek Group overlying the Sunlight Group along Atlantic and Pacific Creeks. Abbreviations as in stratigraphic column: Qa, Quaternary alluvium; Qg, Quaternary Pleistocene till and glacial rubble, lacks morainal development; Tla Tertiary Langford Fm. Alluvial facies; Tlv: Tertiary Langford Fm volcanic facies. Geologic map of Two Ocean Pass Area, north view. In this view, the hydrologic feature lies entirely within the Eocene Absaroka Volcanic field, shown by the dark pinkish red color. The prominent Sunlight volcanic complex lies to the northeast overlying the Willwood Formation shown by the light tan color. The Quaternary Yellowstone volcanic field is shown in light pink to the northwest. The Precambrian, Paleozoic, and Mesozoic rocks to the west and southwest are of the Teton Uplift, Jackson Hole and Gros Ventre Range. Quaternary sedimentary rocks are shown in yellow. Pacific Creek joins the Snake River about 1-mile northwest of Moran. Atlantic Creek joins the Yellowstone River about 1-mile southwest of Hawks Rest. 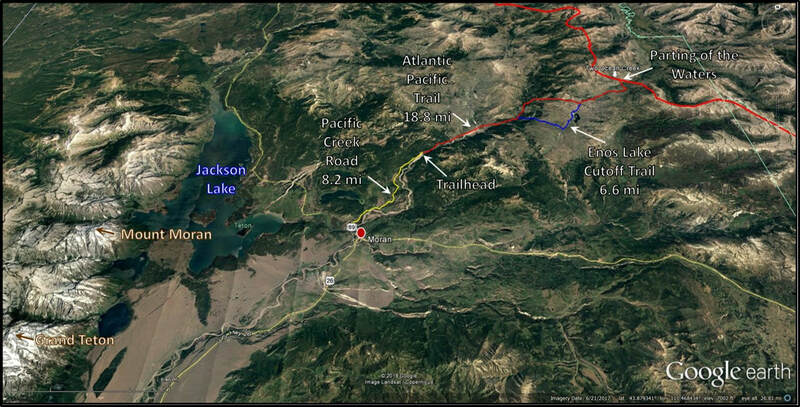 Two Ocean Pass lies in a remote area of the Teton Wilderness south of Yellowstone Park in grizzly bear country. It requires a round trip hike of about 40 miles along the Atlantic Pacific trail north of Moran. This is an old Indian trail that was used by mountain men and fur trappers. It is a journey into western history and breath-taking wilderness solitude, to a very rare geologic feature. Atlantic Pacific trail to Two Ocean Pass and Parting of the Waters. Elevation profiles of trails to Two Ocean Pass and Parting of the Waters. ​Recently, ocean warming has opened a real ocean Northwest Passage in the Canadian Arctic. Ocean previously locked in year-round ice melted enough to have open-water conditions, luring cruise ships and commercial freighters. The Canadian Arctic Northwest Passage. Image: NASA Earth Observatory, 2016, Image of the Day; https://earthobservatory.nasa.gov/images/88597/a-nearly-ice-free-northwest-passage.